LOCATION.--Lat 40°43'34", long 74°23'23" referenced to North American Datum of 1983, Chatham Borough, Morris County, NJ, Hydrologic Unit 02030103, on left bank 150 ft downstream from bridge on Stanley Avenue in Chatham, 1.5 mi northwest of Summit Borough Hall, and 3.0 mi upstream from Canoe Brook. PERIOD OF RECORD.--February 1903 to December 1911, October 1937 to current year. Monthly discharge only for some periods, published in WSP 1302. REVISED RECORDS.--WDR NJ-86-1: 1984 (M), WDR NJ-04-1: 2003 (M). GAGE.--Water-stage recorder with telemetry. Concrete control since Sept. 19, 1938. 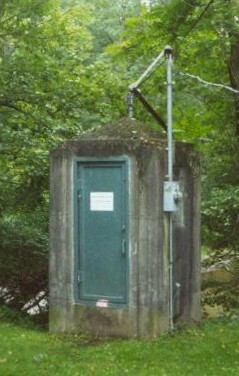 Datum of gage is 193.51 ft above NGVD of 1929. Prior to Dec 31, 1911, non-recording gage at bridge 150 ft upstream at different datum. REMARKS.--Records good, except for estimated discharges, which are fair. Diversion from Osborn Pond by Commonwealth Water Company, Bernards Division, during water years 1903-79. Flow includes sewage effluent from several treatment plants upstream of gage. EXTREMES FOR PERIOD OF RECORD.--Maximum discharge, 3,380 ft3/s, Aug 2, 1973, gage height, 9.36 ft, from floodmark; minimum discharge, 2.0 ft3/s, Sep 11, 1944, since 1937. PERIOD OF RECORD.--Water years 1960-97, 2001, 2004, 2007. REMARKS.--Cooperative Network Site Descriptor: Trace Element Assessment (303d) special study site.